You are well into your seventh hour of your Great British Bake Off binge when you stumble into the kitchen with untidy hair and entirely unreasonable expectations. You are going to bake something. Something spectacular. Something that would make even the stern and hallowed Paul Hollywood swoon. For years, I have left this project on the back burner. If you know me, you know how ardently I abhor assembling layer cakes, and the thought of that process on a miniature scale sounded all too painstaking. However, I finally grew tired of shelling out seventy-five cents per bite at the local bakery and decided that something had to be done. My petit four cravings were not going anywhere so it seemed there was only one clear solution; I had to master the smallest of cakes. Fast forward several weeks and I am five batches strong and mildly obsessed with my newfound power. To my astonishment, the cake, which I had expected to be somewhat tricky seeing as how I was working sans gluten, took exactly one try to perfect. The poured icing? Well, it took four. As frustrating as the recipe testing process can be, I have to admit that I love it. It is wonderful when a recipe turns out spectacular on the first try, but there is great satisfaction in working and reworking a concept with Goldilocks-style gusto until you get it just right. The great news is that I have already done all of that fussy work for you, so you can dodge the satisfying but painful work of fondant-perfecting. Yes, fondant. But not the kind of fondant that requires a hideous amount of smoothing. We are working with a poured fondant. It is a cross between a water icing and melted chocolate. This part of the recipe required so much tweaking because I really wanted to create a hard, smooth shell that would not leave your fingers sticky when touched, but I did not want it to be terribly thick. As it is, these little cakes are pretty sweet - it's cake after all. 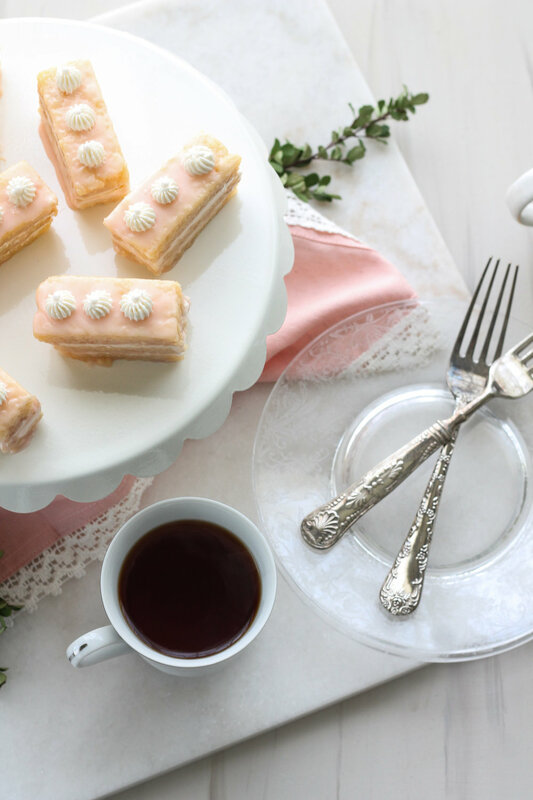 I followed a poured fondant recipe on my first round of petit fours and while it looked professional, it was far too thick, and all of my taste-testers ended up scraping away the superfluous sugar - even my husband who has an insatiable sweet tooth. While I have been known to play with inedible garnishes, I just cannot stand behind a dessert that is not entirely edible. I have great respect for a baker's time, and if we are going to all of this trouble, I feel that one hundred percent of this dessert should be delicious. That all being said, the final fondant recipe I decided upon gives a more translucent cover. As you can see, the layers are still somewhat visible. Personally, I really liked this look, and in our naked-cake obsessed culture, I think it is generally well-received. However, if you are dead-set on the solid finish and do not object to a sugar coma, feel free to go with a thicker glaze. This recipe works very well. You'll notice in the recipe that I suggest using a ruler. While this might sound unnecessarily fastidious, it is really important. 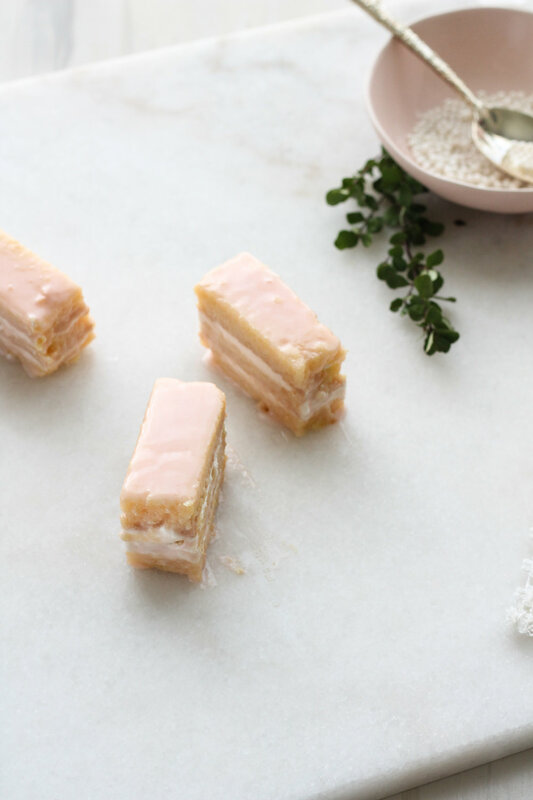 If your petit fours are not cut straight, they will tip over, and after you have gone to this great effort, it is kind of the saddest thing ever; believe me. 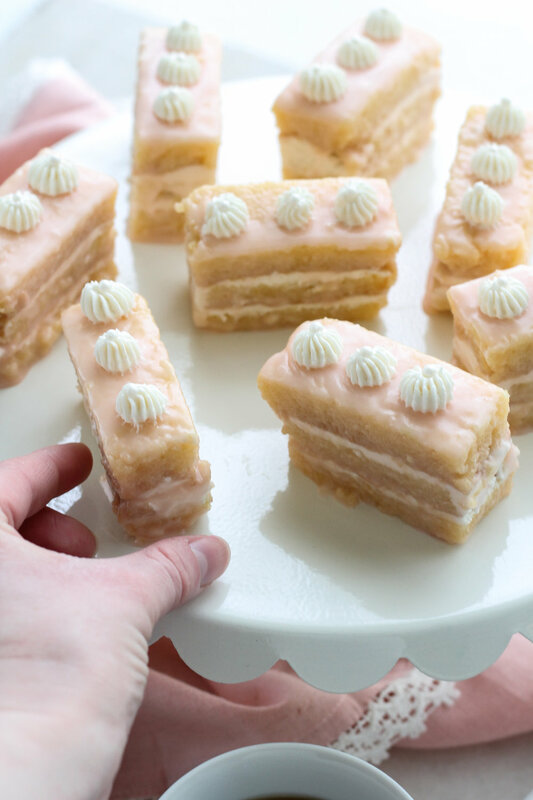 I cut my petit fours into little fingers because I thought they looked adorable, and because...more cake. While the fondant may look too thin at first, it will set! I promise. 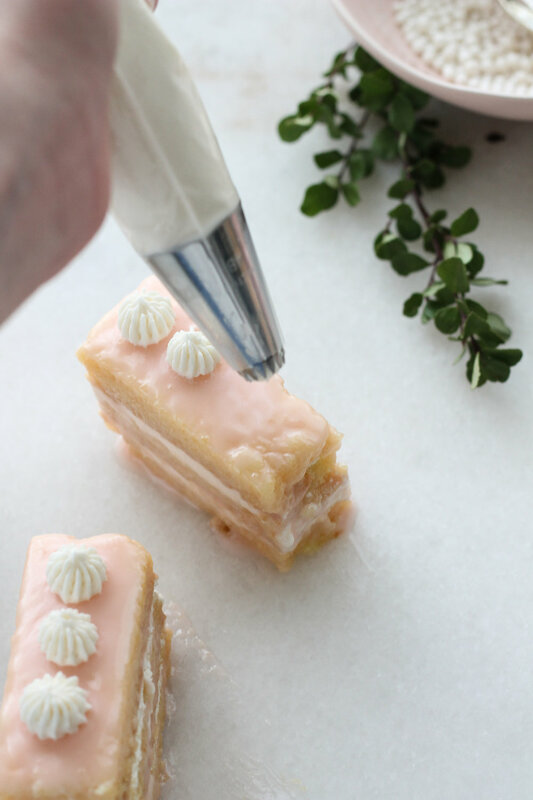 Extra buttercream and sugar pearls are optional, but are they really? 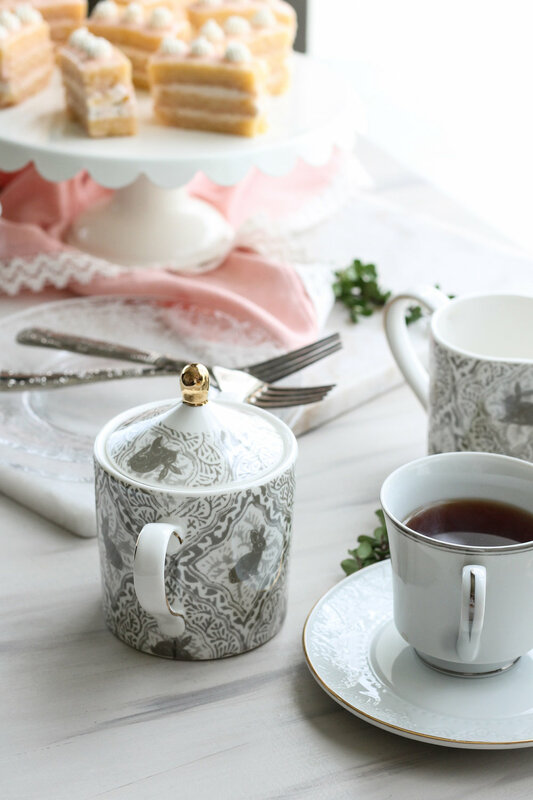 No matter where you are, no matter what you are wearing, if you have one of these little bakes in hand, you cannot help feeling elegant. If you feel inclined to eat them with pinkies up, I understand. Make a pot of tea, call up Mary Berry, or any other sugar-obsessed human you fancy. Bring a platter to a baby shower and you will SLAY. Sit a plateful next to you and take a bubble bath? Go for it. Call your sister and make this your weekend project. Let's make Paul proud. Sometimes the longest days of baking bring the sweetest rewards. This is absolutely one of those times. *Cook's Note: If you are tempted to try to use a standard baking sheet in place of a proper jelly roll tin, please resist! I did this myself only be left with a completely lopsided and half-burnt sponge. The standard lightweight baking sheets we use every day for cookies and biscuits tend to “pop” in the oven, which is just fine if you have a stiff dough or batter, but a sponge batter is very delicate and opt to shift with the pan. Moral of the story? Just buy the proper pan. Cook’s Note: Rather than buying superfine or caster sugar, place granulated sugar in the work bowl of your food processor and pulse for one minute. Allow the sugar to settle a bit before removing the lid of the processor. Preheat oven to 400 degrees F. Prepare your jelly roll tin by spraying with nonstick spray, lining with parchment paper, and spraying with an additional layer of nonstick. In a large mixing bowl, combine eggs and sugar. Use an electric mixer to whip the mixture until it is very thick and pale yellow in color. This will take roughly five minutes. The mixture should fall off the beaters in thick ribbons. Cook’s Note: Without intending to overemphasize, this is the most important step of this recipe. It is very important that you reach ribbon stage before proceeding as the success of your sponge is dependent upon the air that is beaten into the eggs. The mixture will have increased in volume and the color significantly lightened by the time you are done. It will take quite a bit of beating and your arm may be a bit sore by the end, but I can promise you that it will be worth it! Place a fine mesh sieve over the bowl and sift the flour, cornstarch, and baking powder through the sieve and into the egg mixture. Use a spatula to gently fold the dry ingredients into the wet, being sure to incorporate any hidden pockets of flour. Gently fold in extract. Pour the batter into the prepared tin and smooth with a spatula. Do not tap the pan, we do not want to lose any of that air we whipped in! Bake 12-15 minutes. The sponge should be deep golden and should spring back when tapped gently. Lay the pan on a cooling rack and cool for 10 minutes, then remove the sponge from the tin by lifting up the corners of the parchment. Place the sponge on a flat surface and allow to cool completely. Trim away the edges of the sponge so that you are left with a rectangle 12-inches in length and 7.5-inches in width. Slice the rectangle lengthwise into 3 strips 2.5-inches in width. Chill 1 hour. During the last ten minutes of chilling, prepare the fondant. Lay a long sheet of wax paper out onto your countertop. Remove the rectangles from the refrigerator and use a sharp knife to trim away any uneven edges. Slice each rectangle into five fingers 1-inch wide. Place the petit fours on a flat, slotted spatula one at a time, and set over the bowl of fondant. 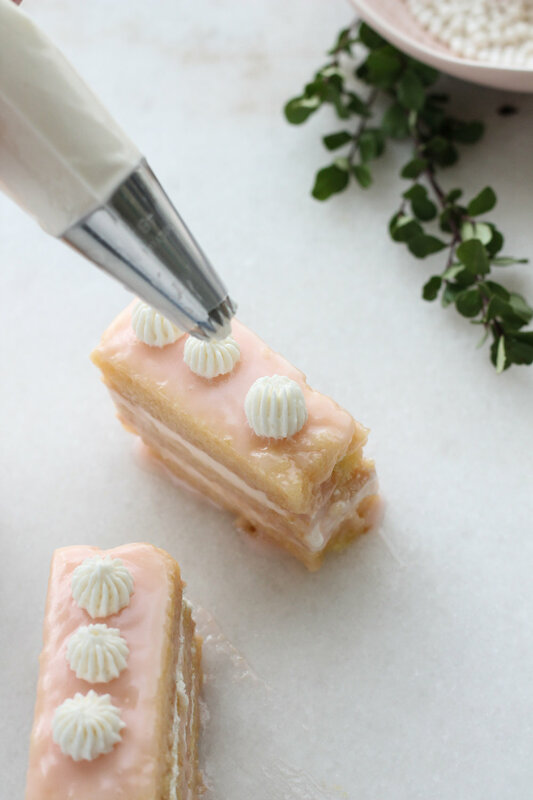 Use a large spoon to drizzle the fondant over the petit fours, making sure to cover all sides, then carefully slide an off-set spatula under each petit four and transfer it to the wax paper to set. Repeat with remaining petit fours. Fill a 2-quart saucepan with about an inch of water and place over high heat; bring to a simmer. Cook's Note: Wipe the bowl clean with a damp paper towel and dry thoroughly before using. Place the mixing bowl over the pan of simmering water, being sure that the water does not touch the bottom of the bowl. Warm, whisking constantly, until the mixture reaches 160 degrees F. An instant-read thermometer is essential here. Return the bowl to your stand mixer fitted with the whisk attachment and whisk on high speed until stiff peaks form. This will take a good bit of time, but do not rush this step. Cook's Note: As the mixture whips, it will cool down, preparing it to accept rather than melt the coming butter. Reduce the speed to medium high and begin adding the butter, about 1 tablespoon at a time. Make sure the butter is thoroughly incorporated before adding the next piece. Cook's Note: If the butter begins to melt, this is a sign that the mixture is too warm. Simply stop mixing, and transfer the bowl to the refrigerator. Cover with plastic wrap and refrigerate for 10-15 minutes, until the mixture is cool and stiff. Beat for 1 minute to loosen the buttercream before continuing with the remaining additions of butter. After all the butter has been incorporated, mix in vanilla extract. Cook's Note: At this point, the buttercream can be transferred to an airtight container and stored for up to a week. Just allow the buttercream to sit at room temperature to soften for 15-20 minutes before using. Place white chocolate in a medium, microwave-safe bowl and microwave for one minute. Stir the chips, then microwave for additional thirty-second increments, stirring after each, until the chocolate is smooth. In a large bowl, whisk together confectioner's sugar, boiling water, almond extract, and food coloring. Fold in white chocolate and stir until smooth. You may need to reheat the fondant several times during the coating process. If it becomes at all stiff while you are pouring, just microwave for thirty seconds and stir well before continuing. Pipe three tiny stars of buttercream atop each petit four and top each with a sugar pearl. 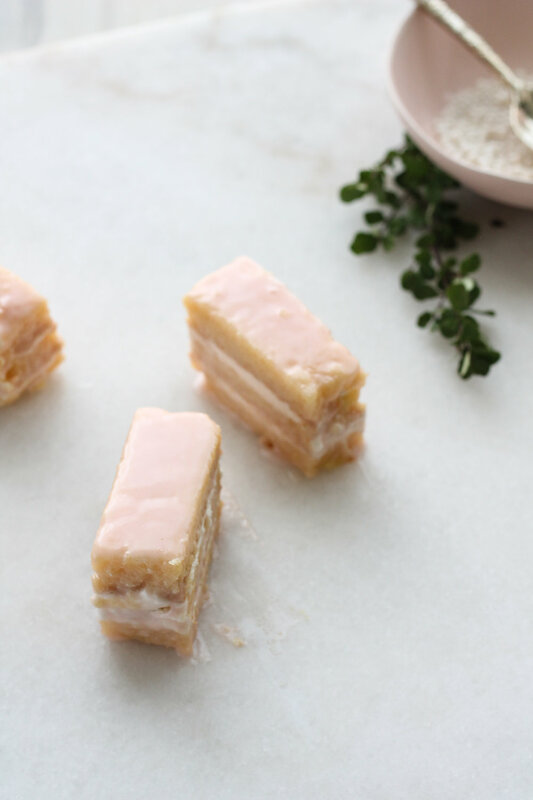 Cover the petit fours and refrigerate until ready to eat; up to three days. Serve cold or at room temperature.